In a Nutshell: As the use of technology grows, many traditional tasks and chores are being replaced with digital solutions. Some things, however, simply can’t (and shouldn’t) be replaced with technology — such as quality financial guidance. 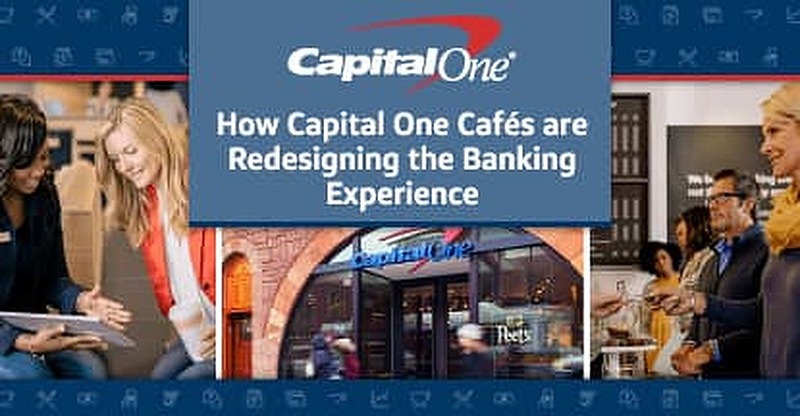 To better suit our digital lifestyles, while still providing the education and guidance we need, Capital One is redesigning the traditional banking experience with a new type of bank: the Capital One Café. A modern blend of bank and bistro, the Cafés offer bank services, financial coaching, and educational workshops — as well as Peet’s coffee, pastries from local bakeries, and free wifi. Capital One Cafés provide a comfortable, stress-free, teller-free banking experience for visitors — Capital One customers or not — with the goal of helping everyone develop confident money relationships. In many ways, the traditional banking experience has become one of those inconvenient tasks we all aim to avoid. As with the post office and drug stores, visits to our financial institution are often relegated to the status of errand — a fancy word for chore. Thus, it makes perfect sense that a growing number of people are using mobile banking to avoid the brick-and-mortar chore. Unfortunately, not all of life’s financial needs can be taken care of online; nearly half of banking Americans visit a physical bank at least once a month. To determine how to improve the in-branch experience for those visitors (and encourage more people to come in) the team at financial services giant Capital One started a conversation with consumers about their relationship with money. The first thing they noticed was a strong confirmation of the increasing shift to digital banking (which came as little surprise to the bank with over 800 branches). More interesting to the team was the information that, while technology was making people’s financial chores more convenient, it wasn’t making them feel any more confident about their finances overall. 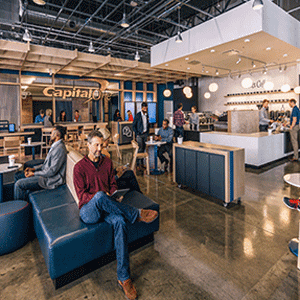 Capital One Cafés are a modern blend of bank and bistro, offering banking services alongside coffeehouse fare. Walking into a Capital One Café, it may take a minute to reconcile the bank logo with the setting. In the Back Bay location of Boston, for instance, visitors are greeted by a comfortable seating area filled with couches and tables and pass by the barista counter before ever making it to the bank desk. Yes, desk — there are no teller windows in the Cafés. Mainly because there are no tellers. In their place are fee-free ATMs that accept deposits and dispense cash in a variety of denominations. Café visitors can talk to a Café Ambassador to receive help opening an account, using online banking tools, or completing any other task for which they would normally go to a traditional bank. A number of private rooms are set aside for those with more involved needs, such as applying for a home mortgage, where video chats enable Café visitors to talk with specialists in those areas. 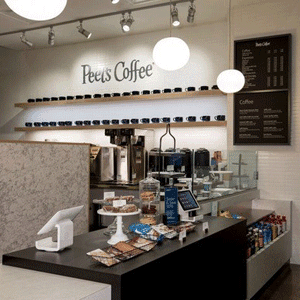 Capital One Café visitors can enjoy Peet’s coffee and tea with pastries from local bakeries. All while sipping Peet’s coffee or tea and snacking on pastries from local bakeries. The team knows that not everyone will want to talk about finances every time they visit. Instead, visitors are encouraged to treat the Capital One Cafés as exactly that — cafés. Free wifi, bountiful charging stations, and an array of comfortable furniture all lend themselves to a day of working or relaxing. Ambassadors won’t start a financial conversation with a visitor unless he or she brings it up, and they won’t push or sell any products. It’s just stress-free help when you need it, and a nice place to drink coffee when you don’t. The Capital One Café in the Back Bay area of Boston has a large, comfortable seating area to encourage visitors to hang out. Part of helping visitors reach their money goals is working to help them better understand their finances. To this end, the Capital One Cafés host a number of educational programs and events intended to help visitors gain money confidence, the lot of which are free to all Café visitors, not just Capital One customers. For a more social experience, try one of the many money workshops put on by the Capital One Cafés. As with the coaching, the workshops are free and open to anyone — Capital One customer or not. Visitors to the Capital One Cafés can participate in free money coaching or workshops open to everyone. While email has certainly limited the amount of time we generally have to spend in the post office, I still find myself standing in its lines at least a few times a year. Similarly, just as digital banking has cut down the amount of time we spend in brick-and-mortar banks, it hasn’t done away with the need for them entirely. Nor, it turns out, does it provide the help we need to develop confident relationships with money. For that, however, you can now go to a Capital One Café. Get a taste of the Capital One Café experience through the Banking Reimagined℠ Tour. If you don’t have a Café open in your city yet, you may still be able to check out Capital One’s redesigned banking experience through the Banking Reimagined℠ Tour. Housed on a giant semi truck, the Tour comes complete with interactive, touch-enabled displays and Hololens augmented reality technology that bring your financial goals to life.